I think this cereal accomplished what it set out to do. You get a taste similar to vanilla frosting. If you've ever snuck a spoonful of Duncan Hines vanilla frosting, the flavor here is somewhat reminiscent. It's a very sweet cereal with a light, familiar crunch. This is not Cinnamon Toast Crunch cereal with frosting. The cinnamon here is understated. After a few spoonfuls, you barely notice the cinnamon at all. Pressed to answer, I'd say that Cinnamon Toast Crunch is the better of the two cereals. A more appropriate name for this cereal would have been Vanilla Toast Crunch. I'm sure they must have tested the effect of the word "frosted" on the purchasing public. But as a guy just wandering down the cereal isle, I find it confusing seeing Cinnamon Toast Crunch next to Frosted Toast Crunch. The boxes and the cereal pieces on them look very similar. My initial thought was that they were renaming Cinnamon Toast Crunch. It's all very confusing. For that reason, I wouldn't expect this cereal to last a long time. I recommend trying this cereal if you already like Cinnamon Toast Crunch. It's a fun, flavorful cereal. If you're looking for fiber and vitamins, keep looking. By the way, if anyone from General Mills is reading this review, I'd like to bring your attention to a growing community of cereal lovers who want Peanut Butter Toast Crunch to come back. 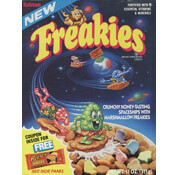 That cereal was also a little better than this new variety. Nutritional Considerations: Each 3/4 cup serving of Frosted Toast Crunch has 120 calories, 3 grams total fat (0.5 saturated and 0 trans), 24 grams total carbs, 1 gram dietary fiber, 9 grams sugar and 1 gram protein. What do you think of Frosted Toast Crunch? One of my absolute favorites. It's a shame it's discontinued. The vanilla flavor really comes through and is really distinct. It's like eating frosting without actually eating a can of a Pillsbury frosting. Not that there's anything wrong with that. Sometimes you just need some sugar. Please bring these back. I've been looking all over for them. They were my breakfast, lunch and dinner! I love this cereal. Definitely in my top 5 of all cereals. 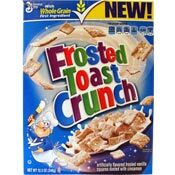 I love frosted anything and I also love Cinnamon Toast Crunch. So, this is the best of both worlds. BTW, my favorite cereals are Cap'n Crunch, Krave, Smorz, Count Chocula and Frosted Toast Crunch. I like the original CTC better. I think the sugary coating is distracting, and a bit too sweet for me. One of the few new cereals in the past couple years I've re-bought several times - of course, I'm a *huge* fan of the original. I'm here to tell you that I did not notice the vanilla in this. The squares seem smaller and they are dusted white and are a lot sweeter tasting to me than CTC. The cinnamon flavor is also fairly muted. I also noticed it seems to get soggy in milk pretty quickly leaving a huge icky factor. I'm a huge Cinnamon Toast Crunch fan and was excited to try this. Frosted Toast Crunch is definitely not as strong tasting as CTC. It's sweet and mildly vanilla and the texture is exactly like CTC. I liked it but didn't love it; it won't become something I often pick up but I wouldn't mind it once in a while. I just picked up a box of this cereal and I love this stuff! I like Cinnamon Toast Crunch pretty well, but sometimes I find the cinnamon flavor to be a bit aggressive. I like that there's just a hint of cinnamon flavor here. If you've ever had Chex "Muddy Buddies" (a.k.a. "People Puppy Chow), this cereal reminds me a little of a chocolate-less version of it. The vanilla sugary coating is addictive!